Ever wanted to synchronize your Mac with devices and accounts? In this case you know that there are only a few really great apps that can synchronize data between your Mac OS X and mobile devices, tablets, online accounts. We mean really syncing with macOS apps like iCal, Address Book, iTunes, Photos, not just transferring files between folders on Mac and device. Below is the list of 7 best (according to our testing) apps that can synchronize data on your Mac OS X with different devices and accounts. We’ve tested online apps as well as offline solutions. What can you synchronize Mac with? Android phones or tablets, iOS devices, other macOS computers, MTP and mounted devices. Online accounts are also supported: iCloud, Dropbox, Google. Our thoughts. 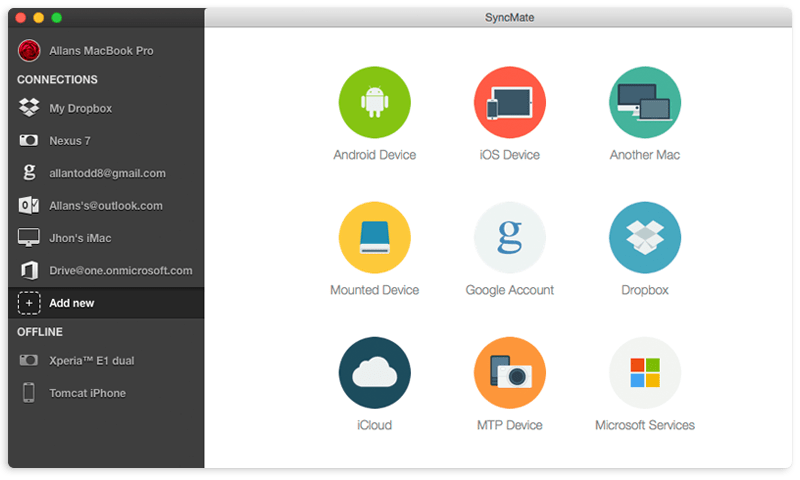 SyncMate is one of the most feature-rich app in this list and the only one that can synchronize data on numerous devices and accounts with Mac OS X apps (iCal, Address Book, iTunes, etc.) directly without the necessity of using cloud sync. Sync options. The range of sync options is rather poor, you can sync folders with files only. 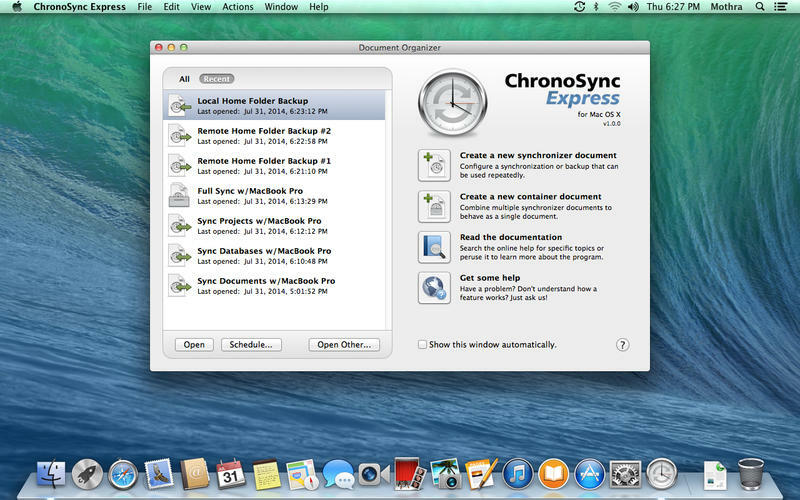 Note that sync is performed only between a pair of folders, not between folder and macOS app (iTunes, Photos). Our thoughts. GoodSync turns to be not a very flexible sync tool. It offers a wide list of supported devices, but allows syncing folders only; has no interaction with built-in Mac apps. What can you synchronize Mac with? Can’t say that the list of supported devices impresses a lot - you can sync with Mac OS X computers and iOS devices only, syncing with other non-Apple devices or accounts is not supported. Our thoughts. Not bad if you need to synchronize macOS with Apple devices only (which in fact can be synced without any third-party apps). The main disadvantage is not being able to sync personal data. For those of you who likes storing data in a cloud, below are 3 services that can sync and store data there. The main advantage of these tools is that you can access your data from any device provided that this device is connected to Internet. Among the disadvantages is that not all of them offer interaction with macOS apps or allow storing and syncing personal data like contacts and calendars. Dropbox is probably the most popular and reliable cloud storage for now. Dropbox offers cloud space for free and allows storing folders with any files there. One of the main Dropbox advantages is that you can share data you have in it with other people (even if they are not registered in Dropbox). Available for Mac OS X, PC, iOS and Android. Just like Dropbox, SugarSync provides you with a cloud storage where you can transfer files and folders. Allows sharing the content you have in SugarSync storage; removing all synchronized files from a PC or Mac in the event of loss or theft. Available for macOS, PC, iOS and Android. How did we rate the best apps to synchronize Mac? With the risk of stating the obvious, we need to remind everyone that macOS is a rather rigid operating system that doesn’t communicate perfectly with other devices with different Operating Systems. 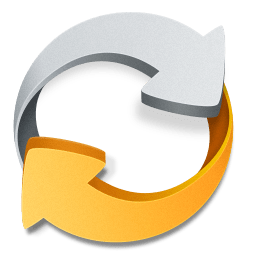 And with Apple discontinuing the support for their built-in Sync Service, things got even tougher for anyone that wanted to transfer data from Mac to a different device. Gathering the best apps that allow data transfer and compare them in terms of functionality was not easy, however, we want to keep our readers informed and up to date. Functionality. Of course, data transfer is all about features and being able to transfer all data types in one go. You don’t want several apps to synchronize Mac when it’s possible to perform folders, media, calendar and contacts transfer with just one app. Flexibility. The entire process of using a Mac OS X synchronization software is quite complicated so you want an app that offers you a lot of setting to ensure optimal performance. OS support. Since macOS is updated time and time again you need an app that is always up to date and can communicate with the latest version of the OS. App lifecycle. In order to get the best Mac synchronization software you need to make sure that the app you choose gets constantly improved by the developer to meet all the most-recent requirements. Hope this article makes the choice of Mac synchronization tool a little bit easier for you. Thanks for reading!